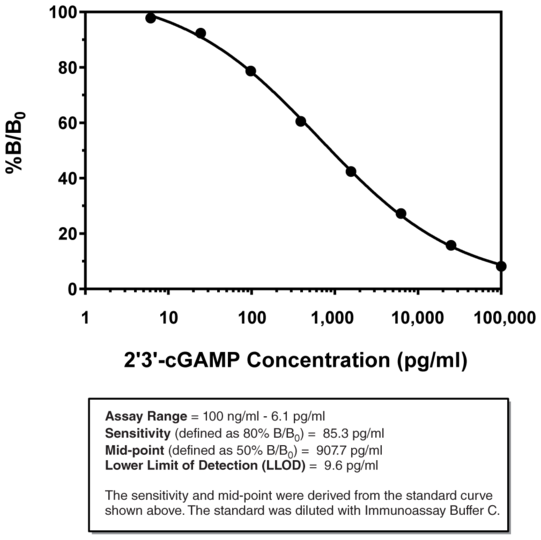 Product information "2'3'-cGAMP ELISA Kit"
Cyclic GMP-AMP synthase (cGAS) is a cytosolic DNA sensor that detects the presence of nucleic acids in the cytosol of mammalian cells as an indicator of bacterial or viral infection. cGAS catalyzes the synthesis of a second messenger, 2'3'-cGAMP, from cytosolic ATP and GTP in response to dsDNA binding. 2'3'-cGAMP then binds tightly to the adaptor protein STING (stimulator of interferon genes), resulting in the recruitment of TBK1 and subsequent IRF3 phosphorylation. IRF3 induces the transcription and translation type I interferon, a potent antiviral cytokine. Activation of cGAS and the production of 2'3'-cGAMP are important in host defense, but also may play role in autoimmune or inflammatory diseases. Modulation of cGAS activity, with subsequent inhibition of induction of 2'3'-cGAMP formation is an active target of pharmacological intervention. Customer review for "2'3'-cGAMP ELISA Kit"